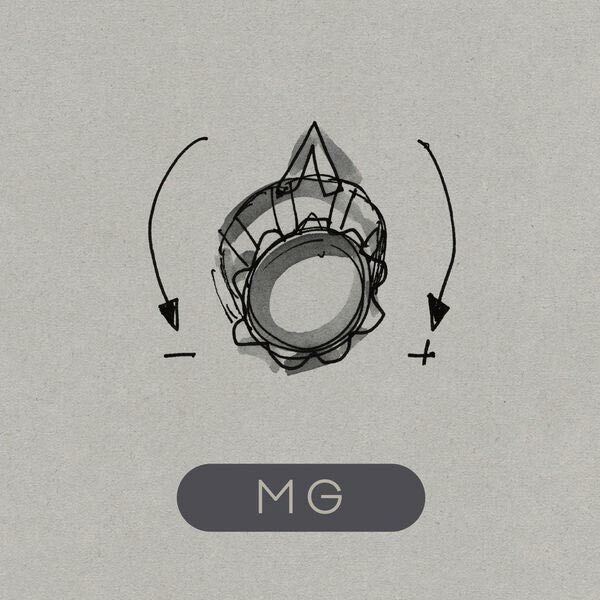 Though it may be poor form, I’m going to start this review with my one unrelenting frustration with Martin Gore’s new solo album MG: every song is just too damn short. Seriously, these tracks are incredible, and they just beg you to get lost in them, but every time I start to settle into one, it ends. The most egregious example is the otherwise perfect “Elk.” Somebody needs to make an extended loop of the center of this song because I could listen to it for hours. Its gorgeous synths, reminiscent of Eno’s endlessly entertaining iPhone 1 app Bloom, softly unfold arounds an unpredictable melody that remains peaceful yet mysterious due to its disinclination towards an anticipated melodic resolution, while other strange and beautiful sounds float in and out of focus on the fringes. It’s a truly engrossing piece of music that gets cut off abruptly at two minutes without so much as a fade out! Now, despite this, I can appreciate the artistry in knowing when enough is enough and keeping things concise rather than over-indulgent. And I can also say that these aren’t sketches begging to be fleshed out. That every song on MG, barring the aforementioned “Elk”, feels like a complete idea. The problem is that Gore has created worlds that I want to live in here, and he’s only giving me a visitor’s guide pamphlet for each. But now that I’ve aired my complaints, let’s talk about what is awesome about MG, which is everything else. The record reminds me of an updated companion to Tangerine Dream’s classic soundtrack to the film, Sorcerer. Here, as there, we are presented with cinematic encapsulations of Berlin School modular synth explorations that capture the grandeur, sci-fi dread, and spiritual tonality inherent to much ’70s electronic music, only compressed into three- or four-minute mini-voyages rather than double LP mental excursions. The drill is fairly familiar here though it has passed through Gore’s long-established filter; it comes out as ominous arpeggiations and resonant noises; dying galaxies rebirthed in the chemical wombs of psychedelic compounds occasionally giving way to heavenly synthetic choirs, celestial bells, and elevated theta waveforms before crashing back down into hellish pools of glassy variable square wave oscillations and 3.5 mm patch cable entanglements. Every so often, a drum sound finds its way in, but the majority of the album’s rhythms are provided by glittering synth sequences and punchy sub bass pulses. I’m tempted to mention highlights, but this kind of album is best taken as a whole, and really, you could just jump in anywhere and pick up on what it’s all about. Gore has honed in on a pretty specific idea on MG without seeming samey, and what’s more is that I feel like it would do the album a disservice to point you in the direction of this or that one, as every song reveals new, hidden details on repeated listens. A blip there, a panning movement there, that kind of thing. I’ve listened to it a dozen times and still don’t feel like I’ve soaked the whole thing in despite the aggressively forward mix. At this point, it should be said that while it has been composed in the spirit of old musics, MG is not simply redundant, nostalgic, or considering Gore’s age, dated analog fetishism. This is a thoroughly and maybe even surprisingly modern approach to a classic genre made by a acknowledged master with an instantly recognizable perspective, using contemporary instruments inspired by the ancient sound making robots of the ’50s and ’60s. According to Gore, the majority of the sounds here were produced by his ludicrously huge Eurorack system, which is essentially a big people Lego set of a synthesizer built from interchangeable sound making and shaping modules. The machines on display here are the grandchildren of the first synthesizers, and after decades of cultural obsolescence brought about by cheaper, more user-friendly hardwired keyboards, these robots have come back in a big way in the last few years and currently dominate a large portion of the electronic music universe, bridging the gap between classic hands on voltage controlled experimentation and modern sound design technology. Given its lineage, the instrument itself is a perfect allegory for the record and it suggests that Gore, one of electronic music’s most famous and influential innovators, is still interested in exploring new ideas, instrument, and techniques despite how stale his other more famous project has become over the last decade and a half. On that note, I guess its time that I mention Depeche Mode. It would probably be pretty hard to find an electronic artist between the ages of twenty-five and fifty-five who wouldn’t cite them, and therefore Gore, as a primary influence. That said, how many of us picked up The Delta Machine? Right. I wouldn’t exactly say that I had given up on Gore, but part of me certainly felt that his best work was behind him and that dude could just keep rolling out variations on old hits to help promote world tours with setlists mostly consisted of hits from the ’80s and early ’90s. And honestly, I was fine with that. Should one of these tours roll through Portland, I would totally go. Like many people, Depeche Mode was a major part of my childhood and my musical upbringing. And as I’ve gotten older, I’ve found that my appreciation for their early work has only grown. But this thing, this new MG record — this puts Gore firmly back in the contemporary underground spotlight. It’s a record for the nerds who got sucked in long ago by David Gahan’s vocal hooks but stuck around for the masterful composition and gear wizardry, hoping that one day Gore might set himself free from the pop format and deliver on the promise of all of the strange intro tracks, interludes, and bridges that made Depeche Mode truly compelling. And the man even did us one better by unexpectedly stepping out of the rut we’d all assumed would be his unfortunate but understandable end, reminding us of how awe-inspiring electronic music can continue to be produced by someone with an adventurous soul and an ear for the future.